To many people stocking up at the grocery store means taking the car, but not everyone thinks that way. ABOVE: A woman loads two bags of groceries into baskets on her bike in front of Vincent’s on 12th Street in Soulard, Oct 13th. When I saw this woman come out of Vincent’s pushing a shopping cart with two bags I expected her to go toward the parking lot. 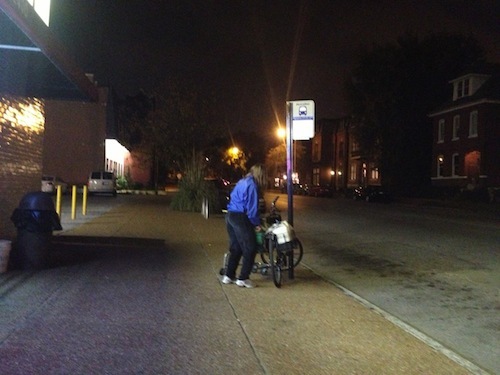 Instead she headed to the bike secured to the bus stop sign. Initially was a bit shocked because, like me, she wasn’t a young 20-something. The more I thought about it I realized I know people my age (mid 40s) to well into their 70s that bike everywhere. If the bus wasn’t about to come I would’ve stopped her to find out more. Given that she has fold-out baskets on her bike I’d say if she has a car at all it doesn’t get used much for grocery shopping. 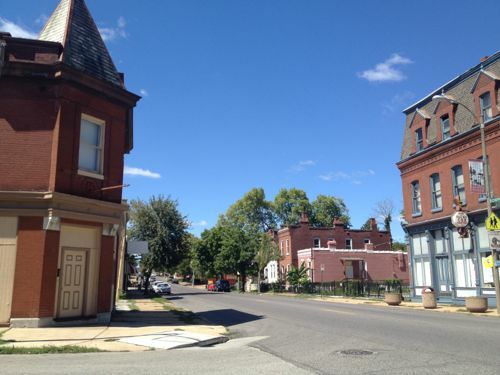 Those of you who drive everywhere may find it hard to believe that a person can live in St. Louis without a car, but more and more are doing so. Note the bike racks in the background, not near the entrance. It’s telling she locked her bike to the sign post rather than one of the two bike racks further away. I never paid much attention to Griffin Delivery because they only delivered in the South Grand area, which I’ve never lived in. But recently I was attending a Public Safety committee meeting at the Board of Aldermen and Griffin Delivery owner Andy Heaslet was there to speak on another bill, mentioning they’d just started food delivery by bike in downtown. My ears perked up and I passed him my card when he sat back down. 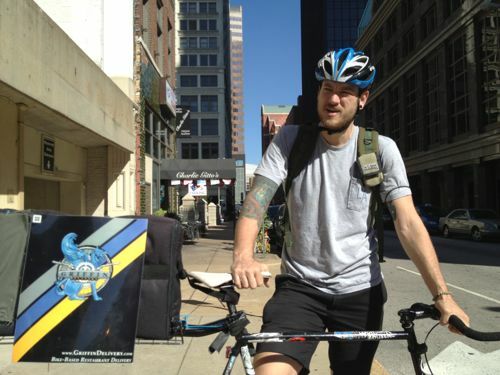 ABOVE: Griffin Delivery’s initial downtown cyclist Micah Goulet on 6th St. outside Tortilla Grill. Eager to try out their delivery service I ordered lunch through their website griffindelivery.com. At that time, last month, they only offered lunch from Pickles Deli (701 Olive) but they’ve since added Tortilla Grille (200 N. 6th) and Lola (500 N. 14th). Heaslet & Goulet told me more restaurants will be added as the service ramps up. 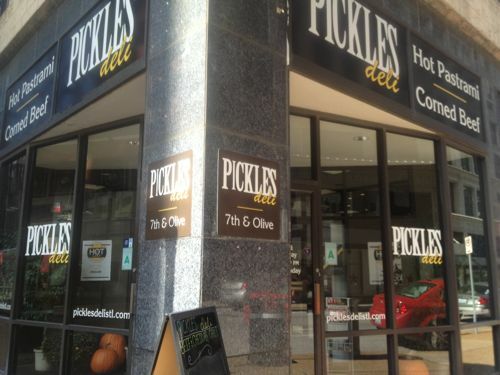 ABOVE: Pickles Deli at 701 Olive was the first downtown restaurant to sign on with Griffin Delivery. 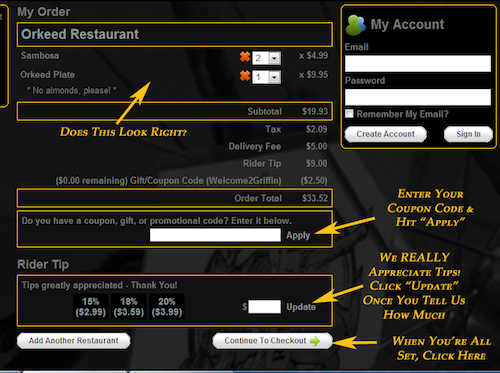 Ordering is done through griffindelivery.com, the menu for each restaurant is part of website. I was able to select the type of bread and cheese for my grilled cheese. You can select to receive email and/or text messages to be notified when the courier arrives at the restaurant and when your food is on the way. My food was still warm when it arrived! ABOVE: Griffin Delivery’s website is easy to use but they offer a step by step guide, this from step 5. Click image to view instructions. I personally hate talking on the phone but Griffin Delivery offers a high-tech way to get food delivered from localy-owned restaurants in a low-carbon way — by bike. Right now downtown delivery is weekday lunch and dinner down south, but they are looking to expand hours in both. On Wednesday morning I ordered lunch 90+ minutes before I wanted to eat, allowing me to concentrate on some work. I can already tell that I’ll be having food delivered more often now, time to set a monthly limit for myself. 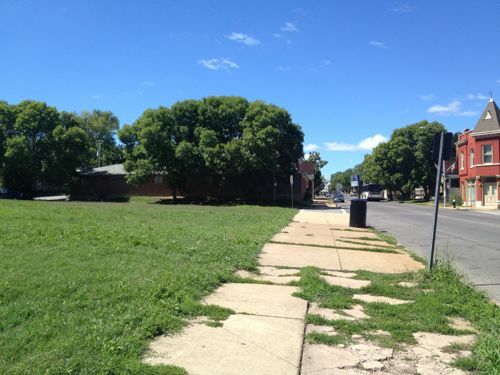 A couple months back I took a look at a mile stretch of South Broadway, from Cherokee to Chippewa (see A Look At South Broadway Through The Marine Villa Neighborhood). At the time I thought about looking at Chippewa, each time I went down Chippewa on the #11 to/from Target I admired the buildings. 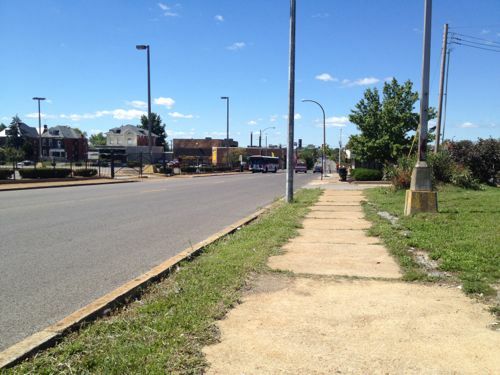 For years I’ve admired the mile stretch of Chippewa St between Jefferson Ave and Grand Blvd., I’d even walked, biked and scootered parts years ago. I had to travel it again though. 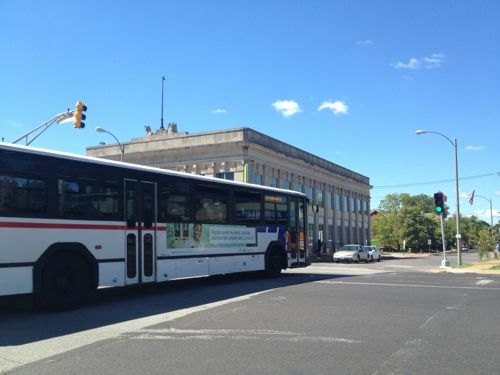 ABOVE: The #11 MetroBus crosses Jefferson Ave. heading west on Chippewa Ave. ABOVE: The formerly urban character of the area has been destroyed by an over abundance of surface parking. 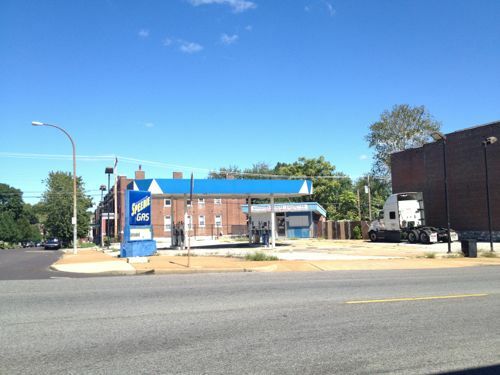 ABOVE: Gas stations used to be much smaller in size, now they are commonly used car dealerships. 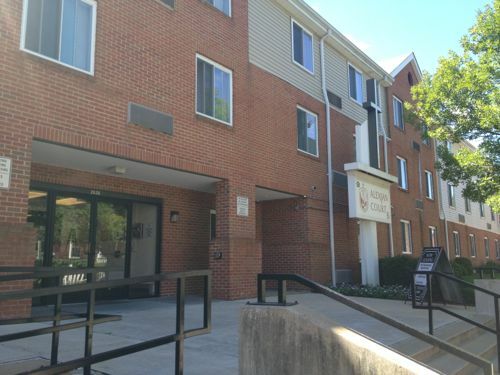 ABOVE: Senior housing, many residents use the #11 bus. ABOVE: The building ages and styles are varied. Wood side porches like this are very rare these days. ABOVE: Many corners have large buildings facing them, no consistent setback to buildings but each block has some up to the sidewalk. ABOVE: Newer infill housing is spaced too far apart, breaking the established rhythm of the street. ABOVE: Red bricks vary from building to building, more warm than the new brick used above. The contrast with the beige brick corner building is striking. ABOVE: Corner buildings mark the corner in various ways, such as this roof. ABOVE: Again the corner building acknowledges its place on the corner. One, two and three story buildings across Chippewa. ABOVE: At Minnesota Ave is one my favorite storefront entrances! 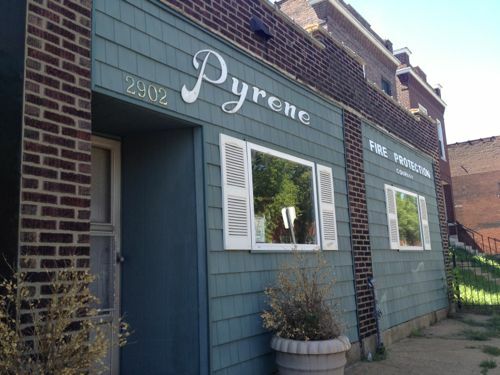 The storefront is currently vacant. ABOVE: Going west from Jefferson to Grand we’ve been going uphill but in places the building lots are well above the sidewalk. ABOVE: Another bad storefront that possibly looked like an improvement decades ago. Corner buildings are all at the sidewalk whereas residences vary in setback. 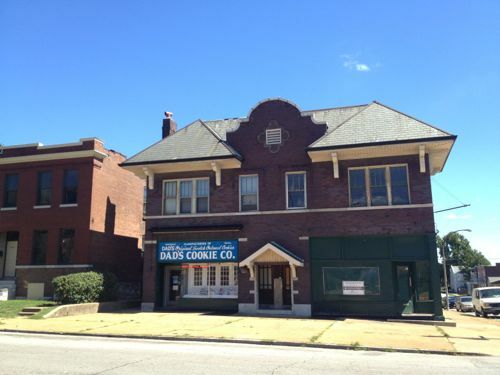 ABOVE: Another quick detour, this time south on Louisiana Ave one block to Keokuk St. to see Dad’s Cookie Co. 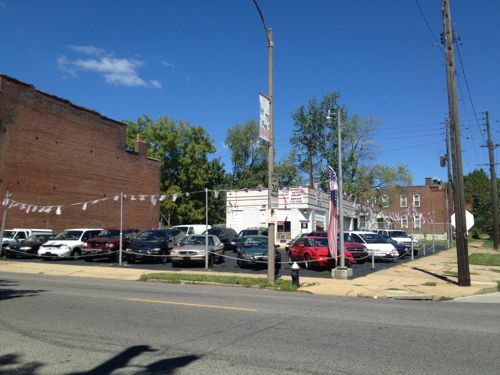 ABOVE: Newer houses occupy the former parking lot of the old Sears store that used to be on Grand & Winnebego. ABOVE: The last block before Grand is a depressing area to walk through, and through is all you’d do. ABOVE: Former grocery store on the SE corner of Grand & Chippewa was built in 1976 after St. Anthony hospital moved to south St. Louis County. 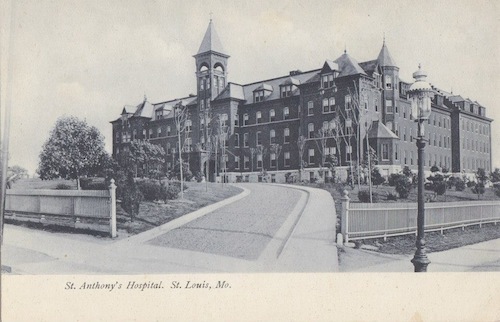 ABOVE: St. Anthony Hospital faced Chippewa, not Grand. 1900-1975. Image source: St. Louis Postcards Facebook group. Quite a stretch! Chippewa Ave was never a commercial street the way Cherokee St was, and still is, but it had many neighborhood corner stores. For decades now people have been driving to bigger and bigger boxes to buy merchandise so these storefronts are no longer critical for daily needs. However, all over this city we’ve seen cafes, niche retailers and others do well in these spaces. 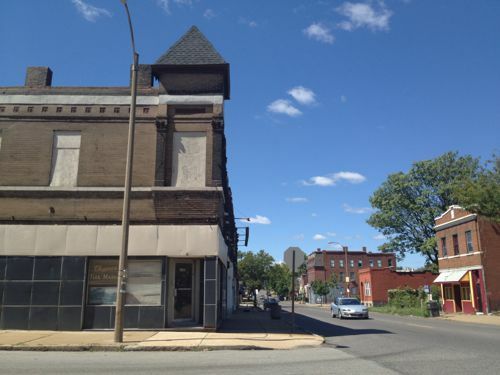 With a cohesive marketing plan Chippewa could become a cool street for new businesses. Attract the gays and hipsters to get those vacant storefronts occupied! 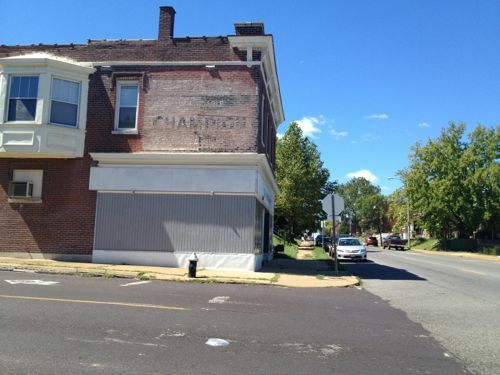 Getting someone to take charge will be a challenge though, the south side of Chippewa is in the Dutchtown neighborhood and the north side is in the Gravois Park neighborhood. This gives the mile road a split personality, although neither focus on it because it is an edge. 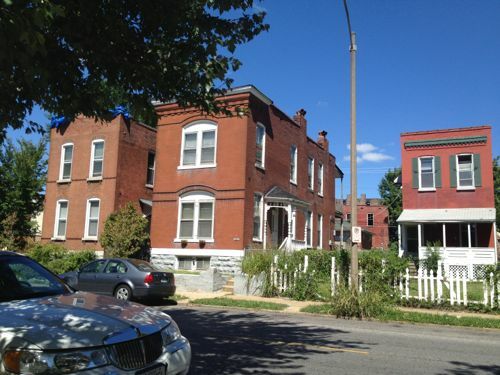 On the positive side, all but the last block before Grand are in the 20th Ward. I’ve known Ald. Craig Schmid for years and he’s a very nice guy, but I don’t see him leading an effort to attract hip new businesses — they might want serve alcohol in disproportionate quantities to food. 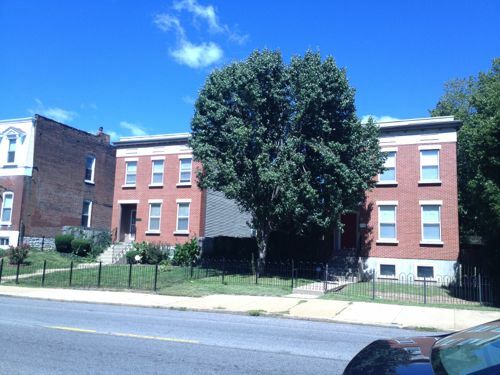 A few years ago, when I was still a real estate agent, I listed and sold the first house on Virginia Ave just south of Chippewa. Thus, I realize the area has real, and perceived, issues but I also think it is worth fighting for. I’m unwilling to write it off, saying the all mighty market has spoken. The market is always changing! In my 22+ years I’ve seen an enormous amount of positive change because people weren’t willing to just discard entire neighborhoods. 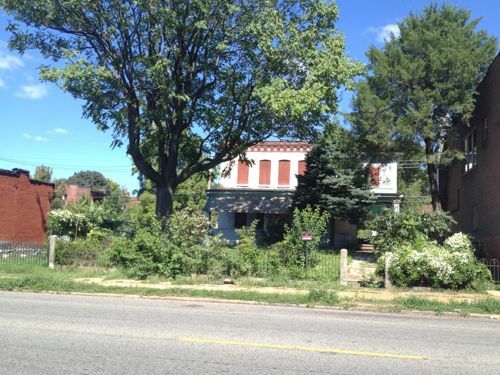 With some effort the market could be altered to see this mile Chippewa as an eclectic gem. 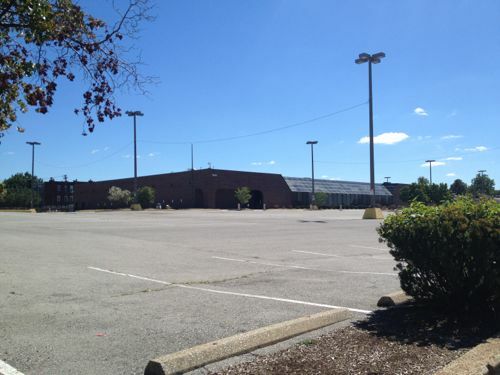 In addition to a new Save-a-Lot the former Foodland site, now known as Jefferson Commons, will have a Blast Fitness. 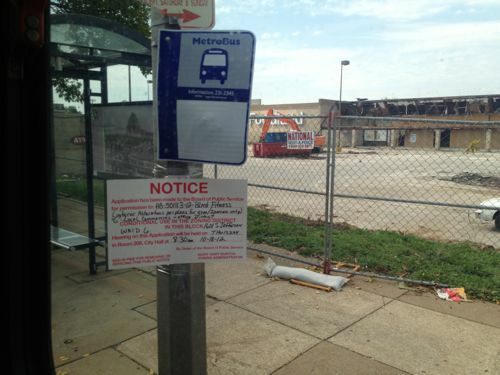 Well, assuming it receives conditional use approval from the Board of Public Service today. ABOVE: Hearing is this morning regarding zoning. 26.44.030 Parking and loading regulations. 26.44.040 Specific parking and loading regulations. The regulations set forth in this chapter or set forth elsewhere in the zoning code and referred to in this chapter are the district regulations in the G local commercial and office district. 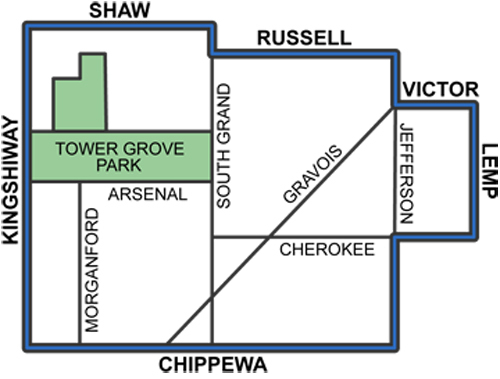 The purpose of the G local commercial and office district is to establish and preserve areas that accommodate a wide range of businesses catering to the personal and home needs of the general public and to provide for employment activity and service to the public which does not detract from nearby residential uses. O. Any permitted use exceeding seven thousand (7,000) square feet provided it is not within a commercial structure to be erected, enlarged, structurally altered or moved. F. Telephone, outdoor pay, if the proposed telephone is located on a lot that is located contiguous with or directly across a street, alley, public or private easement from a dwelling district. The parking regulations for uses enumerated in Chapter 26.20 through 26.40 inclusive, except as modified by Section 26.44.040, shall apply. A. Wholesale, manufacturing and industrial buildings shall provide parking space within one thousand (1,000) feet of the main building sufficient to accommodate one (1) motor car for each ten (10) employees regularly employed at the site, based on the greatest number employed at any one period of the day or night. B. All hereinafter erected or enlarged buildings having or to have more than five thousand (5,000) square feet of gross floor area and used for manufacturing, storage, warehouse, goods display, department store, wholesale store, and other uses involving the receipt or distribution by vehicles of materials or merchandise shall provide one (1) loading space, at least ten (10) feet by twenty-five (25) feet and having a fourteen (14) foot clearance, for each twenty-five thousand (25,000) square feet of gross floor area or fraction thereof in excess of five thousand (5,000) square feet. 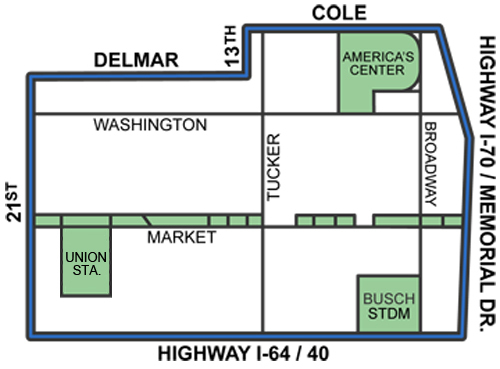 The height regulations are the same as those in the F neighborhood commercial district. For dwellings the area regulations are the same as those in the D multiple-family dwelling district. For other buildings the following area regulations only shall be required. 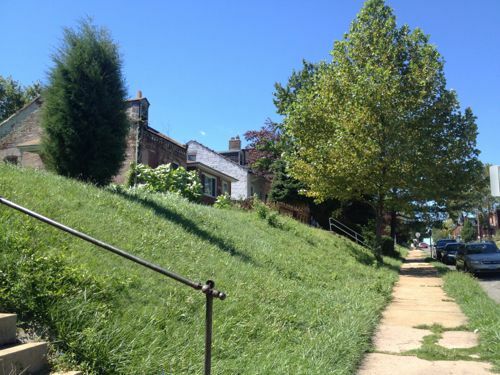 The front yard regulations are the same as those in the F neighborhood commercial district. A. There shall be a side yard having a width of not less than five (5) feet on that side of a lot which adjoins any dwelling district. B. Where dwelling accommodations are hereafter created above any nondwelling use there shall be two (2) side yards each of eight (8) feet in width unless every room within that portion of the structure used for dwelling purposes shall open directly upon a front yard or a rear yard of dimensions as required in the D multiple-family dwelling district. Well it is clear the type of feel desired for G zones. You don’t find it clear? Use-based zoning (Euclidean) is a maddening collection of regulations cobbled together over decades that do nothing to create desirable communities. In the early 20th century it was a way to bring some order to land development but as a tool it has outlived its usefulness. Form-based zoning, on the other hand, is all about creating what the community determines is the appropriate feel for each part of a city. 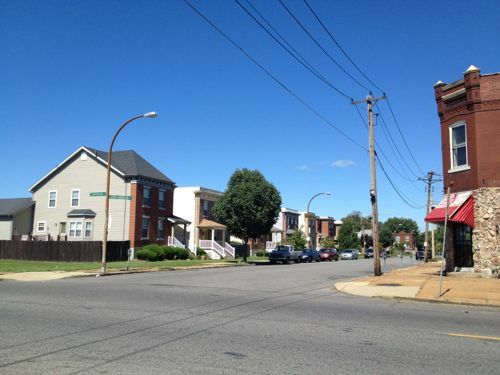 Thankfully we are seeing this new way of viewing land-use regulation in parts of St. Louis City and St. Louis County. It can’t happen fast enough. For a while now I’ve been thinking about doing a post on the huge boarded building on Lafayette Ave but I didn’t have time to do the research. 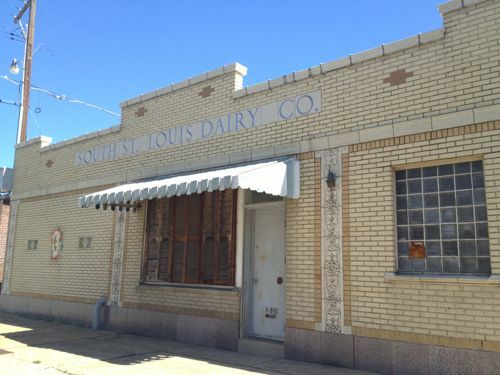 Then I received a review copy of Jim Merkel’s new book: ‘Beer, Brats, and Baseball: St. Louis Germans‘ and there among the many stories was the history of the building. In the years before America fought the Nazis and Japan, Das Deutsche Haus was the place for all things Gemuetlichkeit. Opened in 1929 after a campaign that included help from such German luminaries as former mayor Henry W. Kiel, it soon became the center of German-American life here. The four-story brick building at 2345 Lafayette Avenue was the home of seventy-six German societies within three years after it opened. Built for $380,000, it had meeting rooms and halls able to accommodate crowds from 40 to 1,200. The building was full of activity. Carl Henne, a St. Louisan born in Germany, remembered those days in a 1972 article in the St. Louis Globe-Democrat. “It became the home Hall, which was right across the street,” he said. “We had balls, dances, concerts and Christmas parties there. Every Sunday night we used to always someone to talk to.” He liked it so much that he chose it as the place for his wedding breakfast. Then came the war, or at least the events leading to the war. In January 1939, word got out that Colin Ross, an agent for a Nazi publishing house in Germany, wanted to give a speech at the German House about the German occupation of the Sudetenland. Groups ranging from labor groups to the VFW to the American Legion to the St. Louis Council for American Democracy protested. Seeing the uproar, the board of directors of the German House turned the request down. Later, when the war started, the name was changed to the St. Louis House. Otherwise, though, it remained a place for Germans. When the war ended, the name reverted to the German House. But times were different. People were leaving the city and didn’t feel safe in the neighborhood. Poor finances almost forced the place to close. Still, it remained a popular place for local German groups to have their offices and for events. “We had 800 people at our affair last fall,” Henne, the president of the Schwaben Singing Society, said in a 1972 Globe-Democrat article. “If the neighborhood and parking get better again more German societies will go back — there’s no better place in town. The acoustics are great.” The acoustics were so good that the St. Louis Symphony recorded an album at the German House, produced by Columbia Records. 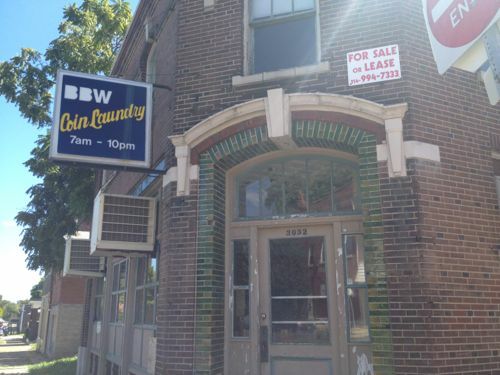 But the place wasn’t good enough to survive just on Germans, and an owner said anyone who wanted to could use it. A Mexican bar and restaurant opened in the basement. The bowling alley closed. It was a matter of time before the place joined the ranks of shuttered German gathering places. The German House was just one of the buildings Germans put up around St. Louis to gather for singing, dancing, exercising, arguing, or the theater. One was the Strassberger Music Conservatory. 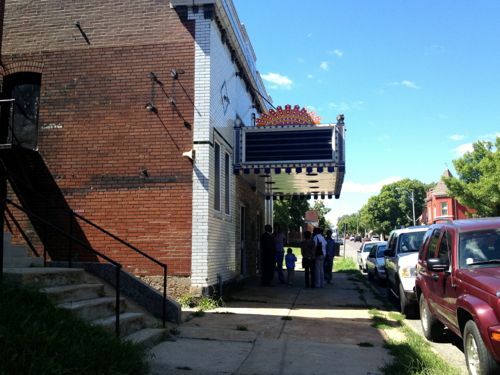 The three-story building at Grand Boulevard and Shenandoah Avenue once was a place to celebrate the city’s German music culture after it was built in 1904-05. Today it has a mix of upscale apartments, offices and stores. 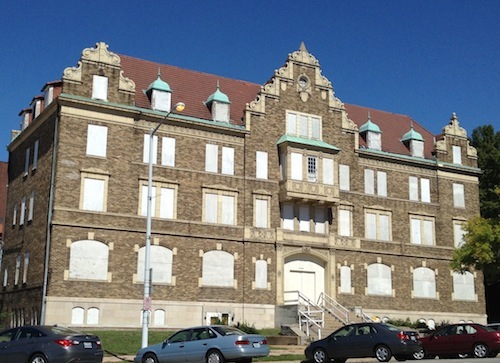 Another building originally meant for a gathering place of Germans stands at 2930 North Twenty-first Street. In 1867, German settlers founded the Freie Gemeinde, or “Free Thinkers” Congregation. The building was home of a Gesangverein (choral club) and a library with three thousand books. Some other buildings in the city formerly served as homes for Turner groups. 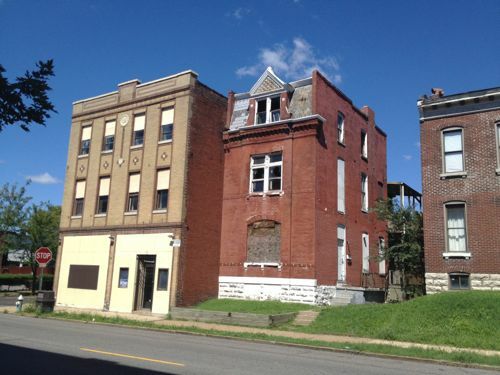 They include the North Side Turnverein, 1925 Mallinckrodt Street, and the South St. Louis Turnverein, 1519 South Tenth Street. 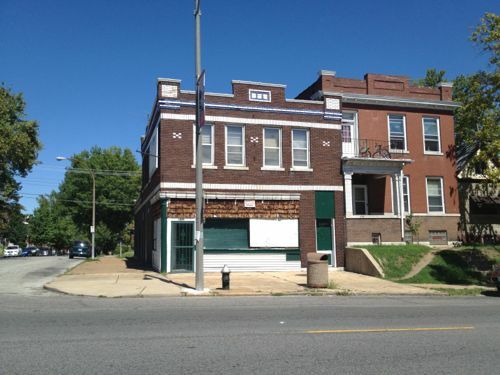 One building that is home to a still-active group is the Concordia Turners, 6432 Gravois Avenue. But that’s an exception. Almost all have a different purpose from the original German intent, and that includes the German House. The end for the German House came in 1972, when the Gateway Temple of St. Louis, Inc. bought it for a church and school. In 2007, the Church of Scientology of Missouri bought the building for $1.6 million. Church officials plan to renovate the building, which would include a counseling area, classrooms, and an area for services. But for now, it’s unused. 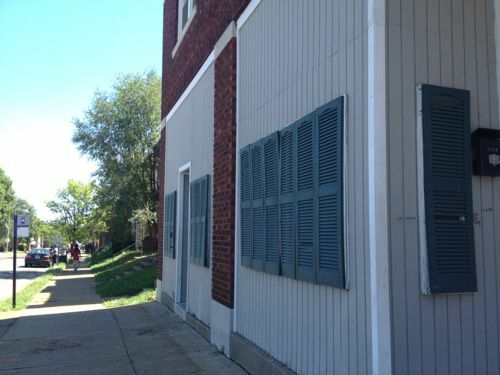 The building doesn’t appear to be listed individually on the National Register of Historic Places, but it’s included in the Lafayette Square Historic District (PDF of nomination). ABOVE: The building appears to be in very good condition. The building was just a decade old when Germany invaded Poland, suddenly a bad time to be of German ancestry. Had WWII never taken place would the building still be open and filled with German societies? 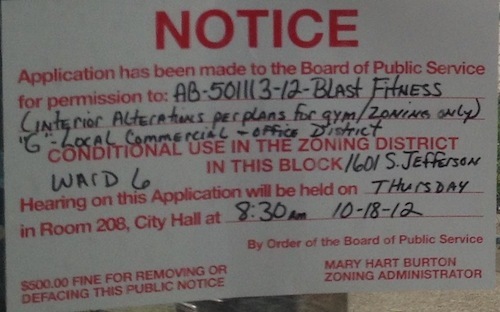 Would it have shuttered anyway due to the city’s population decline? Of course, we’ll never know the answers. 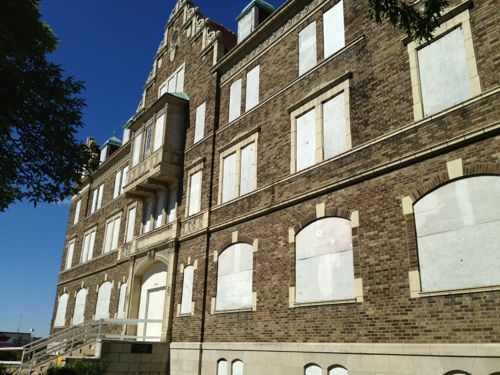 More relevant questions are in present time; does the Church of Scientology of Missouri still have plans to renovate and occupy the building? If so, would the public get a chance to see the interior at any point? Pick up a copy of Jim Merkel’s new book for a fascinating look into the German part of St. Louis history. The decision to add three teams means the top two bidders for new teams — St. Louis and Sacramento — are virtually assured of a spot in Major League Soccer. Building Blocks ins and outs, booms and busts of St. Louis real estate and development. City Affair Hosts monthly events including happy hours, speaker series, and more. 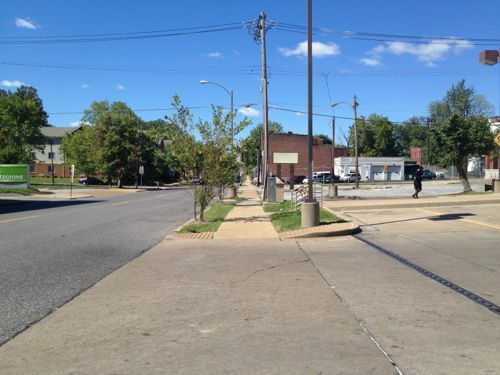 Gateway Streets looking at transportation issues in the Gateway city. Maryland Heights Residents for Responsible Growth a voice for residents in community development. Saint Louis Patina detailing the beauty of St. Louis architecture and the buildup of residue-or character-that accumulates over the course of time. 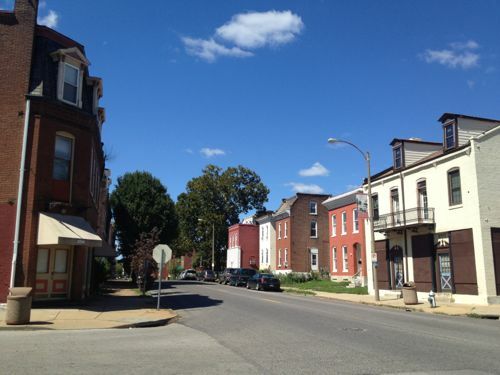 St. Louis City Talk thoughts on the current events and day to day occurrences in the City of St. Louis. Transit Turning Point transit options in St. Louis. Cherokee Station Business Association over 50 independently owned and operated businesses over seven blocks on Cherokee Street. Built St. Louis historic architecture of St. Louis, Missouri – mourning the losses, celebrating the survivors. Historic Aerials great historic aerials from different years. Streetmix Design, remix, and share your neighborhood street – all in your browser!